I didn't like buying the books every month. I would be engrossed in the story and then have to wait three weeks to see what happened next! Not what an avid reader wants to do! I prefer reading everything in one go myself, but I totally understand people who like serials too. Heck, I wouldn't be writing one at the moment if I didn't. I have to admit I haven't read this one, but I LOVE King. He's a great writer. The Shining is one of my favorites. I haven't read The Shining, but I loved the movie. I'll get around to reading it soon though. I'm slowly making my way through his backlist, starting with Carrie. This sounds like a good one. I just finished 11/22/63 and it was great! I've seen the movie but never read the book. I still haven't seen the movie, but I'll be sure to now that I've read the book. I havent read the book... but after this review, i sure wanna read it..
Nice to meet you Michael! Hey did you see the actor who played Coffey died last year? I have read the books and I love them. I consider it a magical realism story and I used them as a study. King is such a great writer. Years after the fact I collected each of the individual volumes. I would've read them in 1996, but for whatever reason I wasn't a Stephen King reader at the time, but was immediately intrigued when I read about the unique release format. I think it was the start of a revitalization in King's career, where he shifted back toward relevance. I am just starting to really get into the works of Stephen King, even though I tried (and failed) to read Cujo many years ago. I've always loved the movie adaptations of his books though, Carrie and The Shining most especially. I couldn't read the Green Mile, I have a real problem with stories where someone is wrongly accused or discriminated again, no matter how profound the story. This is the first time I allowed myself to read the plot! Thanks. One of my favorite books of all time! I loved the movie too. Stephen King is the kind of writer I hope to be. He's always striving to be better than his last book--always growing. Yes. And he is also quite prolific to boot. We could all learn a thing or two from him. I am talking about this novel a bit tomorrow :) This is my favorite King novel for sure. And the movie version is absolutely fabulous. Great post!!! 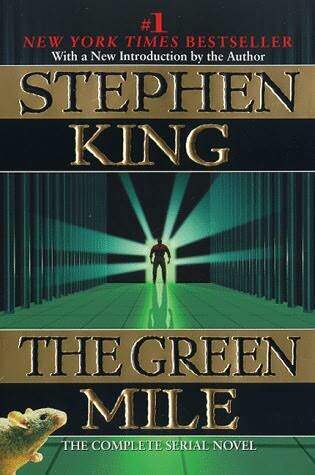 Great choice for the letter "G." Stephen King is my favorite author. His book "On Writing" is a wonderful guidebook for writers and inspires me every time I read it. The Green Mile is just one example of his genius. Great story! Thanks, Luana. I've also read On Writing, and like you said, it's truly inspirational stuff.